This page provides resources for discovering more about the history of your village. It is available for people in the community to add historical photos and information about the village. The War Memorial to those who were killed in WW1 and WW11 is in St James' Church on the wall at the side of the High Altar. "The gift of Altar Candlesticks was made and this tablet erected." To the Glory of God and in memory of the men who from this Parish laid down their lives in the Great War 1914-1918, and those who served and died in World War II, from 1939-1945. Recent photographs around the village and of village events. Pictures provided by parishioners and members of the public from around Huncote and the surrounding area. Link to the images on our Facebook page of old artefacts found in Huncote Parish. This details the history of the alehouses of the village and lists the innkeepers and beerhouse keepers at Huncote from 1752. 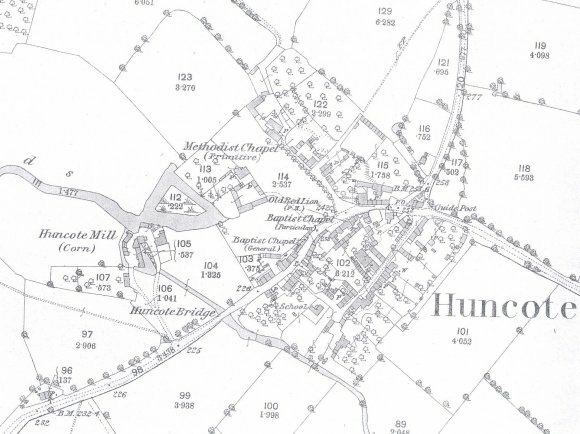 Huncote as it was in 1849. History of the schools of Huncote. Pictures from around the quarry. Details of an excavation from 1990 on Cheney End. A report on Iron Age archaeological sites. This page provides resources for people researching their family tree in the village and includes a useful guide specially created by the Record Office. A guide created by the Record Office to help people discover the history of their building. Details of all the births, deaths and marriages recorded for Huncote from the 1600's until 1899. The online catalogue contains descriptions of a wide variety of records from many sources, both public and private, relating to Leicestershire, Leicester and Rutland. The Historic Environment Record (HER) is the most complete record of archaeological remains and historic buildings in Leicestershire and Rutland. It covers from prehistoric times to the present day. Some guidance developed by the Record Office for working with historical documents dating back to the period of the introduction of the Gregorian calendar in 1752. Before 1752, the year began on Lady Day, 25 March and ended on 24 March. Earlier documents dated between 1 January and 24 March may be referred to with two years; for example, 1 January 1745/6. In 1752, England adopted the Gregorian calendar which the rest of Europe had been using for almost two hundred years. In 1582, when Europe had changed from the Julian calendar that had been introduced by the Romans, Pope Gregory decided to remove the excess days that had been accumulated by the inaccuracies of the Julian calendar. When England adopted the Gregorian system of dating, the same adjustment had to be made. So it was that in 1752 for the first time the year began on 1 January. In order to adjust the difference between the Julian and Gregorian calendars, 2 September was followed by 14 September. From then onwards England and the rest of Europe have shared the same calendar.